Karla Chaloupka, MD, PhD, private docent, is the founder and head of Oculoplastics, Orbital and Lacrimal Surgery Unit at the University Hospital Zurich since 2003. She graduated in 1994 at the University in Zurich, covered general surgical training during 1995-1998 including the completion of a thesis at the University in Basle and the Royal Free Hospital in London, followed by the ophthalmic training in Basle, Lucerne and Geneva. She was a consultant/chef de clinic in neuroophthalmology and oculoplastics in Geneva. She did an OPAL-Fellowship in Australia with A. McNab 2004/2005, a PhD in Nanotechnology at the UCL, London and the habilitation at the University Hospital Zurich, Switzerland. 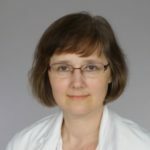 She is teaching at the University Zurich, and is a worldwide invited lecturer and hands-on surgeon (most recent invitations include to, Estonia, Indonesia, Nepal, Czech Republic, Mexico…). Since 2006 she is involved in a humanitarian project in the south of Mexico which became part of the national training system and was honored with prestigious prizes. Her research interests include bench to bedside solutions (e.g. development and patent filing of a synthetic lacrimal canaliculus based on nanotechnology), innovative approaches in lymphangioma, facial palsy and reconstructive surgery.